The other day, I was talking with a friend about the whole writing thing, and he was like, "Why would you do that to yourself?" and I was like, "Fair question. Hmm." In the end, I could have gone on and on about all the things that make writing the Best Hobby-Dream-Mutant-Hybrid EVER, but said friend's eyes probs would have glazed over like delicious donuts. After all, it ain't clear to everyone how interrupted sleep patterns and constant obsessing can make life worth living. It takes a special breed to find fun in coming up with similes as creative as "glazed over like delicious donuts." Fo shiz! Despite all the fun, being a writer can be stressful at times. A lot of times. You don't get the ice cream without milkin' the calf (huh?). So here are five totally weird techniques for dealing with writer-stress - and beyond! In truth, a nap can go both ways: you can wake up with worries of queries/chapters/books seeming eons away, or your cat could wake you up too early and leave you more miserable than before. But if you ask me, it's a risk worth taking. Mmm, sleep. 2. Use flashcards. Or, you know, pieces of paper, since I know I don't always have notecards ready to be whipped out (alas, it's why I'm a horrible student). The idea here is: compartmentalize. Identify exactly what's stressing you, whether it's a plot hole, deadline, or unwanted emotion like jealousy. 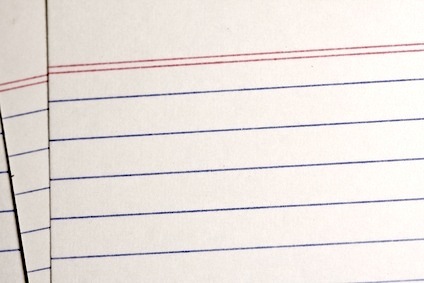 Then write down each thing separately. All of a sudden, instead of a giant must-not-be-named demon of angst floating over your head, each stressor is contained to a fragment of dead tree. Holla! As you complete tasks, you can rip up the card! Or, if it's one those you-can't-really-control-it things - say, your well-meaning aunt's insistence that the process would go much more smoothly if you just self-published - limit your "worry time" to a fake notecard study session. This could even lead to your brain not caring about the material. Err, unless you were/are a good student. Gold star! 3. Take up a self-calming mantra. Like a monk! Only sexier. Anytime you feel that writer-blood pressure rising, whip out your chant. It can be short, like "I am awesome" (you are), or long, like "My percievance of this situation has been generated by my own neural passageways and will have no significant effect on the universe as a unit of space-time." Uh-huh. 4. Visualize! Imagine a snarling dog who wants to maul you. 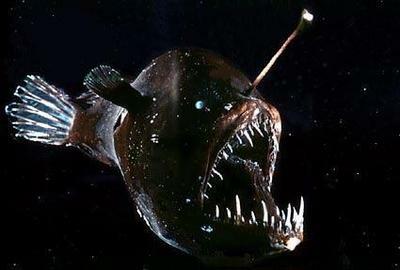 Or a cat, or a female angler fish, whatever. That animal is your writing stress. Now: tie it up to a post. With a rope made of titanium unicorn hair. There is no way that baby's getting at chya. It can only watch as you fly off on that generous unicorn into the land of inner peace. Sayonara! Hells yeah. 5. Enlist quotes. When you're stressed, the last thing you might want to hear is someone else's opinion on the subject. But the advice of old dead white men can be GREAT in this situation. Same goes for the wisdom of dead revolutionaries. And of one other person... Trust me on this one. I love the enthusiasm in this post. Refreshing. I liked the post too. Nothing's better for writer's stress than a good play-list that matches the current theme of your writing. I heartily endorse the nap. To the list I add The Bath (hot, with delightful scented things of your choice added) and The Loud, Fast Music -- put on something loud and fast and energetic, madly clean the house for ten minutes. Change your environment, change your mood. I was reading over the comments on this post and came across the one above, and went "Hey, that sounds a lot like my housemate..." And then realized it WAS. Got here independently, minutes before I did. My number one stress reliever (when it's writing, anyway) is to take a drive somewhere. Doesn't have to be scenic in pretty, just the act of moving somewhere gets me calmed down. Going for a walk does this too. I do my best thinking on the move, and usually I can "solve" my stress if I let my brain get at the problem. I fill up the birdfeeder and watch the sparrows fight. Auditory and visual distraction. Love, love love everyone's comments & techniques! <3 We need an anti-stress arsenal handbook made specifically for writers, I think... that comes with a giftbasket of food, of course. :D Rock on! Great ideas, great advice, thanks Em! There's always the "Cry It Out" method. Sometimes a senseless bawl goes a loooong way. Alternatively, you can always just go for a walk. Titanium unicorn hair = the bristles on Chuck Norris's toothbrush. LOVE this post. Ripping up notecards really is a fantastic idea! Totally agree with the mantra and Mariam's comment. I LOVE PLAYLISTS! I make one for each wip and it totally motivates me and gets me writing. Great post Emilia - I may or may not have taken a peek at it when it was in the queue... :) I'm with MiSchu on the notecards sounding like a fantastic idea.